Ada soalan mengenai Chalets Cote Mer? Dengan lokasi mudah di Kepulauan Seychelles, Chalets Cote Mer adalah tempat yang hebat untuk menjelajahi bandar yang menarik ini. Keseronokan pusat bandar hanya sejauh sahaja. Hotel moden ini berada di sekitar kawasan tarikan bandar yang popular seperti Hospital Kerajaan, Galeri Seni George Camille (Mahé), Muzium Praslin. Di Chalets Cote Mer, segala usaha dilakukan untuk membuatkan tetamu berasa selesa. Oleh yang demikian, hotel ini menyediakan perkhidmatan dan kemudahan yang terbaik. Hotel ini menawarkan pelbagai kemudahan di lokasi untuk memuaskan hati tetamu termasuk yang arif. Suasana Chalets Cote Mer terpancar di dalam setiap bilik tetamu. internet wayarles, bilik larangan merokok, penyaman udara, panggilan kejut, meja hanyalah sebahagian daripada kemudahan yang boleh didapati di hotel tersebut. Sepanjang hari anda boleh menikmati suasana yang santai dengan kolam renang terbuka, menyelam, memancing. Nikmati perkhidmatan yang sukar ditandingi dan lokasi benar-benar berprestij di Chalets Cote Mer. Harap maklum tempahan untuk 4 hari dan ke atas layak mendapatkan pengangkutan percuma dari jeti ke hotel. Tempoh minimum untuk menginap di penginapan ini adalah 3 malam. Sila maklumkan pihak penginapan bilangan kanak-kanak dan umur mereka sebelum tiba. Kanak-kanak 2-11 tahun akan dicaj EUR 10 setiap kanak-kanak semalam jika menggunakan katil yang ada. Untuk Bilik Superior, hanya 1 katil tambahan dibenarkan. Untuk Pangsapuri, hanya 2 katil tambahan dibenarkan. Bayaran tambahan akan dikutip di penginapan. We stayed 5 nights at this guesthouse and all in all it was a nice stay. The rooms are a little bit old fashioned, but i think thats normal there. The pool area and the rest of the outside area looks very amazing and like in the pictures. The breakfast was ok but i missed things like cheese or something instead of 10 different types of marmelades. Also more fruits would be nice. The dinner is 25€ per Person for a set menu (drinks excluded), which is too much for whats offered. Another option is a 20 min walk, where you find a nice takeaway. The WIFI is 10€ per person for your entire stay, but thank god it worked. Overall, the place charges you for things which i think should be included, remebering you pay more than 150€ per night and only have breakfast. We spent eight nights at Chalets Cote Mer and enjoyed our stay very much. The hotel situation is stunning, one of the nicest locations we have ever stayed in. Chalets Cote Mer considers itself a guesthouse rather than a starred hotel, and the prices (very reasonable by Seychelles standards) reflect this. It must be borne in mind that it is also a fairly small establishment, catering for fewer guests than many of the other hotels and thus the range of choice, particularly in terms of meals, is smaller. Nevertheless everything is beautifully prepared and the quality is, in our opinion, five star. The dining room staff are excellent; very friendly, obliging and hard working. We had a Superior room which was very clean, good sized, with a stunning view of the bay. The pool area is superb; we have stayed in upmarket hotels with far less superior facilities. There were always sunloungers available, including some lovely secluded ones on the lower terraces nearer the sea. I had booked the superior room, but when I arrived I was told we had been upgraded to family room, which was larger and had more beds. It had a great view however the balcony overlooked the pool, so it wasn't private. Spoke to management who told us the superior room( with a private balcony) was taken for the night, but they would move our stuff into the room the next day. Apart from this minor mishap, everything else went smoothly. Nice polite staff. The view from the superior room was amazing, and felt very private. It was 5 mins walk from the jetty, had quite a few steps, so not ideal if you have a lot of luggage or have mobility issues. Their breakfast was good, very filling. Ommelette, fruit, juice, toast, variety of jams, and cereal. They cleaned the room every day. One negative thing would be the internet, it was slow, cost 10 euros for the entire trip. Could only log onto one device at a time, but the hotel staff tell you this before you buy it which is helpful. Overall, a pleasant stay, would stay here again. Not so luxury but good value for the money. 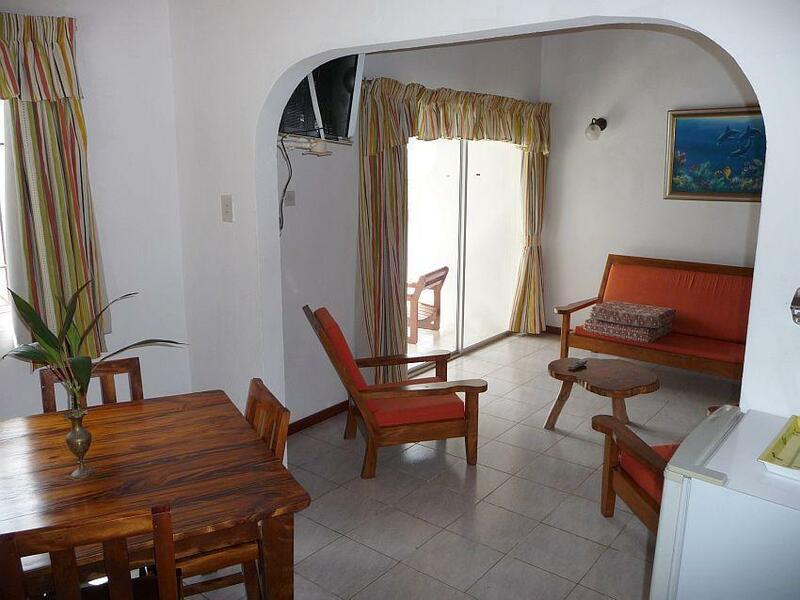 Spacious room, nice balcony with view to ocean and harbour. Friendly and helpfull staff. If you need nice place to stay near the harbour this is perfect place to stay. Enjoyed our stay. 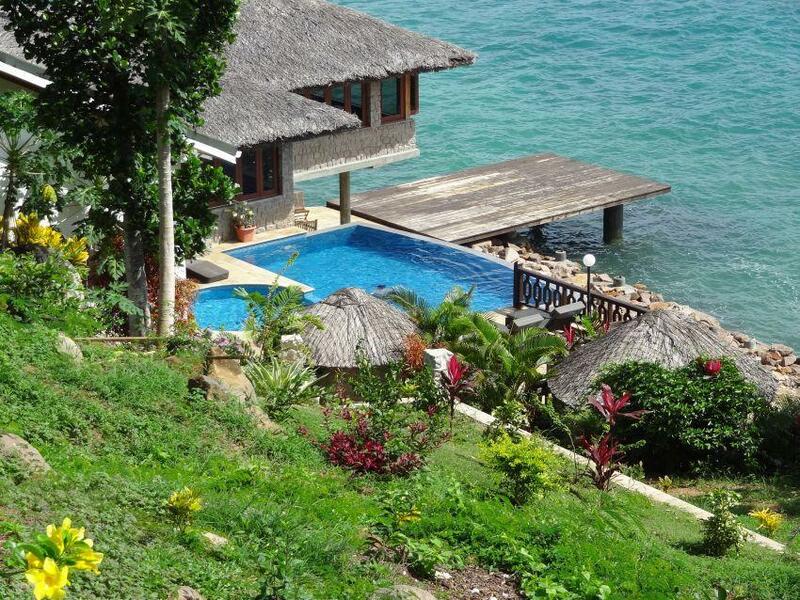 We stayed one week in Praslin in this hotel. We thought it was good value for money. The room was rather tastefully done, cosy, clean and above all with a fantastic view over the sea. The room had both a nice balcony and big windows towards the sea. It was all over a well maintained hotel, clean and well managed. There is direct access to the sea and enough sun beds to accommodate anyone wanting to relax by the sea in the hotel. The beach isn't of sand but rather rocks with a little ladder down to the water. The hotel is conveniently located close to the jetty doc. Unfortunately the water is a bit polluted because of this so it isn't all that nice to swim here. Otherwise we didn't feel that the jetty doc was bothering us in terms of noise and traffic. It is possible to rent a car for 40 euro per day from the hotel. There are deals for 35 euros only outside the hotel if you take the car for several days. The hotel can arrange tours to nearby island. We did this and absolutely loved the day trip. Be prepared that there is a fee for each nearby island you want to visit due to the fact that many of them are protected areas. The fauna & flora is absolutely amazing on these islands and it is definitely worth going. The fee to access Cusine island was 50 euro and Curieus 30 euro so be aware it will cost you some money. It's still worth going as you also will be able to snorkel in crystal clean water. The corals on the Seychelles is unfortunately in quite bad conditions due to water temperature rice (climate change) and over exploration (fishing and too much human interaction). We recommend the beaches on the south side of Prasil island that are only like 10 minutes drive from the hotel. These beaches are virgin and there will be no other tourists or any other people for that matter! Fantastic Infinity pool, Large clean rooms with great Ocean view. Quiet location close to Jetty. Really enjoyed our 3 nights here. Easy access to ferry jetty. This is a small boutique hotel overlooking the Ocean with a fab infinity pool. Staff are good and attentive and there is a nice reasonably priced restaurant (Euros20 for evening meal. Breckfast had limited choice but was fresh and enough for us. You do need to hire a car though as apart from the jetty it is a little remote and though there is a local bus service this tends to be irregular and crowded (and hot)and taxisa are relatively expensive. Its a great base to see all Pralin has to offer. You do need to be resonably fit as there are lots of steps as it is on a hillside. The hotel usefully gave us a transfer back to the Jetty. we had a wonderful time during out stay at Chalets Cote Mer. It was a delightful place and we had a great view of the bay and could see the ferries come and go. just a great visit. It was everything we had hoped for and more. The management and staff added so much to the experience. We had a very enjoyable stay, which largely met our expectations. 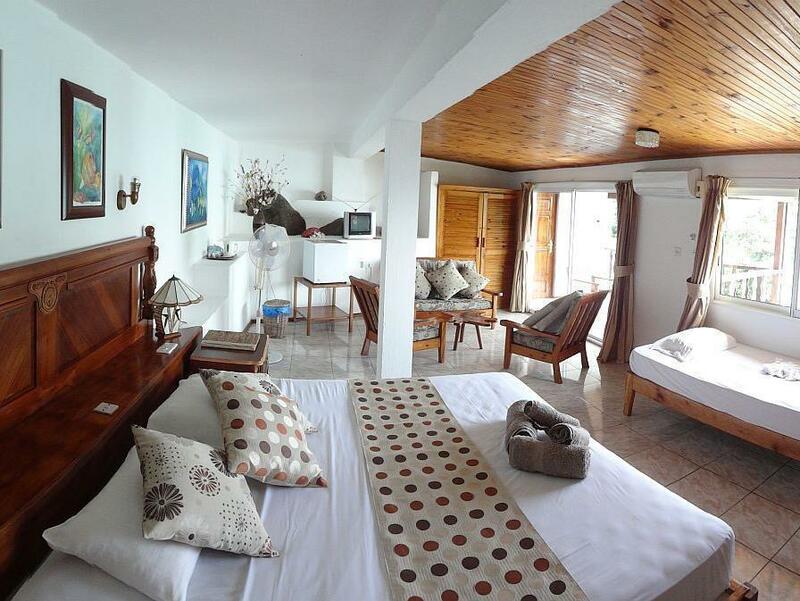 Not a large luxury resort, Chalets Cote Mer's quiet charm and friendly staff are its selling points, along with large comfy rooms and a magnificent view of the bay. A very welcoming place. 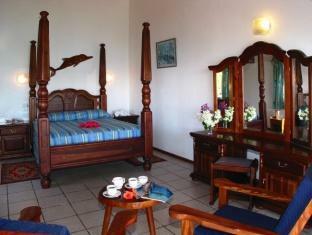 All rooms with a sea view and 4 poster bed. Excellent meals served,home cooked. Always a choice of main course (at least).The dining room overlooks the Indian Ocean. The only drawback would be that the pool is too small for serious swimming. However, there is always the sea. (About 10 metres from the pool). The Staff soon learned my name and my particular preferences for breakfast etc. We had a wonderfull stay at this hotel. The view over st. Anne's bay is just stunning. The staff was very friendly and helpfull to organise your sightseeing trip. The food at the hotel restaurant was suprisingly good!